The principle of operation of the rotary vane vacuum pump is based on the rotating lamellas. Rotor (2) is situated excentric on the top in the cylindrical stator (1), so rotor is almost touching the stator. 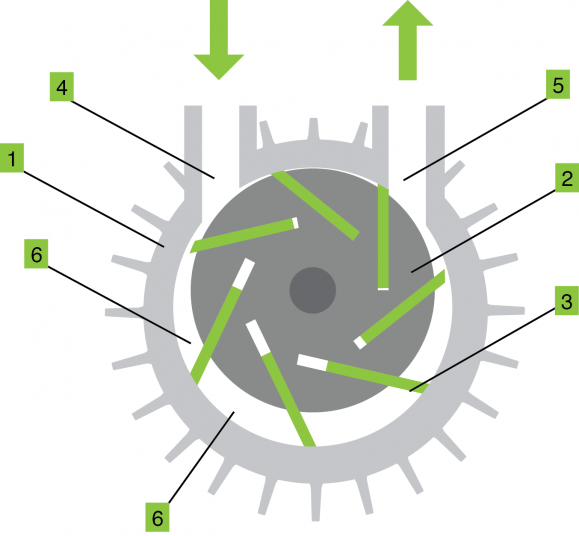 The lamellas (4) are pushed towards the wall of the stator by centrifugal force. Between two lamellas and stator it comes to the volume change of the compression chambers (7) by stator rotation, due to this fact the gas is sucked.